Jesus is always in the middle of people’s problems. Where someone needs to be freed, where someone is unhappy, there He is. The Pharisees, on the other hand, thought only about whether or not it was the Sabbath. Their bad faith killed the spirit. 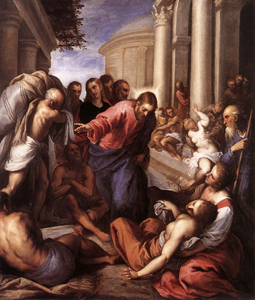 The paralytic had been struggling in the void for 38 years because he hadn’t found Jesus. “Do you want to be healed?” Jesus asked. Finally, the paralytic had found the Man who could cure him. Jesus told him, “Rise, take up your bed and walk.” The cure happened in an instant. For the old paralytic, worn down by years of discouragement, everything was now new. That paralytic waiting by the water—doesn’t he make you think of those who are equally powerless to do good? How do we plan on solving, all by ourselves, problems that are supernatural in scope? Don’t you see every day, all around you, a constellation of paralytics who “move” a lot but are incapable of walking away from their lack of liberty? It is sin that paralyzes, ages, and kills. We must set our eyes on Jesus. We must immerse ourselves in the waters of prayer, confession, and an open spirit. You and I can remain everlasting paralytics—or we can be carriers of others and instruments of light. Let’s seize this Lent to make the right decision. Download our 2015 Daily Lenten Devotions booklet here.